The United States is going to become another Greece, and it’s largely because of poorly designed entitlement programs. As the old saying goes, demography is destiny. Let’s look at just one piece of that puzzle. 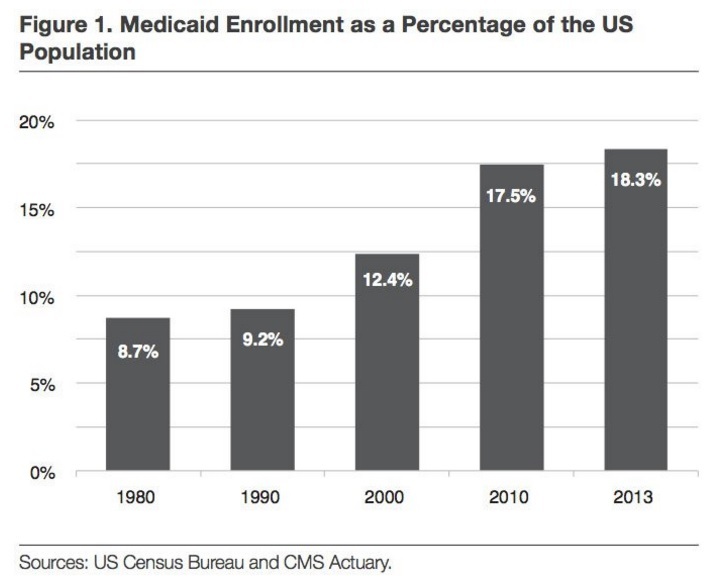 James Capretta of the American Enterprise Institute has a very sobering summary of how Medicaid has metastasized into one of the largest and fastest-growing entitlement programs. You should read the entire article, but if you’re pressed for time, I’m going to share two grim charts that tell you what you need to know. First, we have a look at how the burden of Medicaid spending, measured as a share of national output, has increased over time. 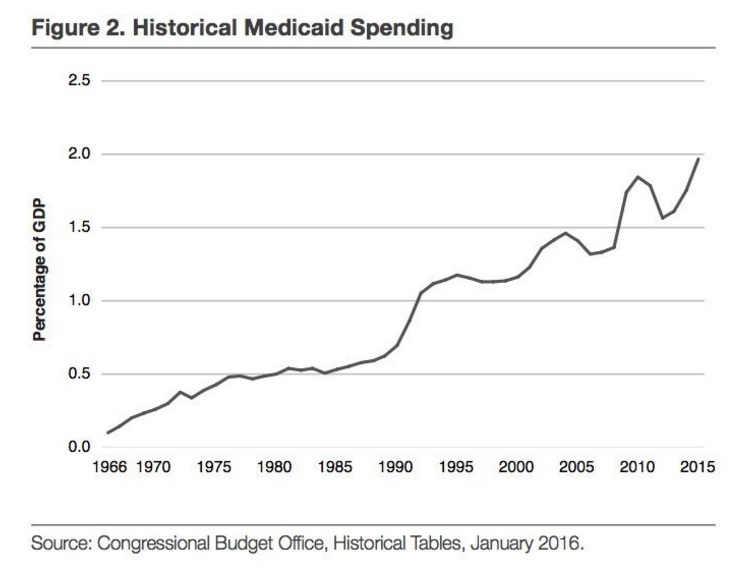 What makes this chart particularly depressing is that Medicaid was never supposed to become a massive entitlement program. It was basically created so the crowd in Washington could buy a few votes. 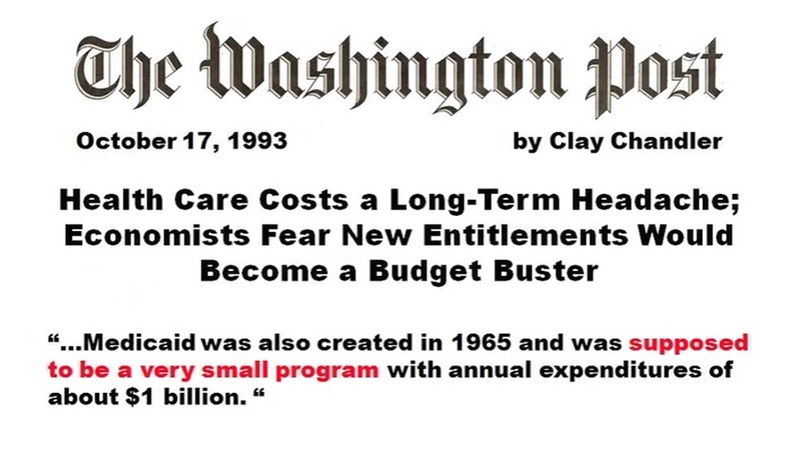 Yet the moment politicians decided that it was the federal government had a role in subsidizing health care for the indigent, it was just a matter of time before the program was expanded to new groups of potential voters. And every time the program was expanded, that increased the burden of spending and further undermined market forces in the health sector. This is why entitlement programs are so injurious to a nation. But Medicaid isn’t just a problem because of its adverse fiscal and economic impact. The program also is exacerbating the redistribution culture in the United States as more and more people get trapped in the web of dependency. Which brings us to our second chart from Capretta’s article. Here’s a look at the share of the population being subsidized by Medicaid. As a fiscal wonk, I realize I should care more about the budget numbers, but I actually find this second graph more depressing. In my lifetime, we’ve gone from a nation where the federal government had no role in the provision of low-income healthcare, and now nearly one out of every five Americans is on the federal teat. Even though we’re far richer than we were in the mid-1960s when the program was created, which presumably should have meant less supposed need for federal subsidies. For further background on the issue, here’s a video I narrated for the Center for Freedom and Prosperity. I urge you to pay close attention to the discussion that starts at 1:48. I explain that programs with both federal and state spending create perverse incentives for even more spending. This is mostly because politicians in either Washington or state capitals can expand eligibility and take full credit for new handouts while only being responsible for a portion of the costs. But it also happens because the federal match gives states big incentives to manipulate the system to get more transfers. P.S. All of which explains why I think Medicaid reform should be the first priority when looking at how to fix the entitlements mess, even before Medicare reform and Social Security reform. P.P.S. I’m not overflowing with optimism that Trump will tackle the issue, but there is a feasible scenario for him fixing the program. P.P.P.S. Regardless, one would hope all politicians would agree that it’s time to tackle rampant Medicaid fraud. All federal (and state) entitlement programs Will always be poorly designed,,, they never work long term and will ruin any country that tries them… It is the nature of the beast…. The big problem is that all the growth in these various programs require ever larger revenues at the cost of the rest of the economy. An economy that is already showing signs of serious dysfunction. The money going to Medicaid and the other programs is money that is not going to wealth creation. They say that demography is destiny, but what is causing the demographics to change? I don’t think that it’s an accident that the demographics are the worst where the state entitlements are the most generous. There’s some psychological distortion that the programs create from both sides. It might get bad, it might even get very bad. But as long as we are the international reserve currency, we will never get near the basket case, that is, Greece. Another question is why do we need 2 social programs to help subsidize health care costs for those that can not afford it? Dump Obamacare and use Medicaid. Then shrink Medicaid by reducing the cost of health care and creating a robust economy so most people don’t need it. Per the chart in the article, 18.3% of the population is enrolled in medicaid – the goal should be to reduce this to 5%. This is why I am always amused when I hear a leftist announce “We’ve tried the free market and it doesn’t work.” No- we have not tried the free market. And, yes, it would work. That’s why I’m an advocate of repealing Obamacare. Not sure how the republicans let themselves get talked into the “and replace” tag they like to add to the end. Simply repeal it, and roll back the rest of the crap they rolled out in the 70’s and 80’s and let the free market take over. Let companies provide basic healthcare plans if they like, and let me pay for additional options I might want to add. Oh, and as for fraud- if you get the government out of healthcare, you reduce the fraud automatically. People will pay more attention to the bill when they are paying it themselves. You have a depressing way of reminding us of our folly. Keep it up. Stay “outside the beltway”.